In the history of our ecclesiastical traditions, one comes accross excellent composers and musicians, who have shaped into the sacred art of music elements of their personality, as their own history has also become the history of sacred music. Among these men belongs St John of Damascus, this great father and teacher of the Church, who, according to Souidas, was «a well educated man, who was second in his education.» He became known for his profound theology, setting the bases of dogmatic theology; and waw also an excellent composer, the greatest writer of ecclesiastical sacred chants. He is considered to be the turning point between our ancient and modern ecclesiastical music, having formalised and renewed the sacred music and its writing system, and setting an end to the increasing since the IVth century musical misuse. He cleansed the ecclesiastical chant from the improper elements of the secular music that had been introduced into the Church, without, however, dismissing the existing ecclesiastical songs, which were prescribed since antiquity. As, for instance, the ancient Greeks included into their music parts from other peoples, the Phrygians and the Lydians (cf. Phrygian and Lydian tones or modes), they took care to develop and advance it, and to give to this foreign music the same character making it into a indeed greek music. Thus, Christianity did not fulfil itself with what it received from the national music of the Greeks, but it took care to transform this music to fit the needs of its divine worship, to cultivate and gradually advance it to something that provoked awe. Thus, the so-called «Byzantine» music came into existance; a music which was shaped by the Fathers of the Church and especially by St John of Damascus to fit the needs of our holy faith and the character of our religious poetry and hymnody. With St John of Damascus, a second period of melody creation starts. In this period, the joint work of the writer and the musician gets divides; that is why the poets are no longer called melodists, but instead hymnographers. And the first period of melody creation started form the first centuries and continued until the VIIIth century and contains the Irmologikon and the Sticherarikon melos, in which the melodies are rather plain and symmetric. The second period contains various kinds of hymns, such as cherbim hymns, communion hymns, alleluia's, kratemata, polyelei, which belong to the papadic genre, which is the more advanced than the others. According to his biographers (Theophanes the Confessor, the Patriach of Jerusalem John, the Great Logothetes Constantine the Acropolite, Souidas, and Kendrenos), he was born in 676 AD and died in 756 AD. He was from Damascus, which is why he was called Damascene. He was from a rich family. His father Sergios, was director of Damascus, which was then under Sarascene rule, but according to others he was the treasurer of the Halif Abdoul Melik I. His father paid the ransom of the slave Kosmas from Calabria of Italy, who educated John, as well as the hymnodist Kosmas the Melodist, who later became bishop of Gaza. At the supplication of the patriarch of Jerusalem John, St John becomes a monk and is ordained by him a priest. He chose to live in the monastery of St Sabbas which was not far away from Jerusalem, which is why he is also called Jerusalemian. There he passed his life studying and writing. He fought strongly against the iconoclast emperors Leo III the Isauros and Constantine the Kopronymos. He wrote letters to the inhabitants of Constantinople, defending the honour and worship of icons. It is said that Leo in rage commanded that they imitate the writing of St John and send to the Kalife a faked letter of him, which would suggest that Damascene was giving away Damascus to the Byzantines. The Kalife cut of the hand of St John, but that was miracuously cured. 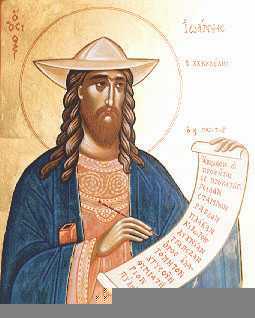 Then the sacred psalmodist wrote the First Irmos of the Canon of the Tone I «Σοῦ ἡ τροπαιοῦχος δεξιά, θεοπρεπῶς ἐν ἰσχύϊ δεδόξασται». Because of his rhetorical ability, he was named «Chrysorrhoas» and «Chrysostome», and among the melodists «Master of music». Copronymos called him «Mansour», and his other opponents called him «Saravaites» and «Arklas» to ridicule him. The Orthodox Church celebrates his memory on the 4th of December, whereas the Western Church on the 6th of May. The works of St John are split into five categories: (i) philosophical or logical, (ii) theological, (iii) explanatory or critical works, (iv) poetic works, and (v) music works, namely songs. As a hymnographer and a musician, he simplified the psalmody of his predecessors, and took care of the canonisation and the formalisation of psalmody, composing for this reason the Octoechos with the eight tones, which were constructed by some transformation and change from the multitude of melodies present in the Greek music, whose character was compatible with the devout and sacred sentiments of the Church and which led to the glorification of God and to compunction. On the other hand, he disallowed the use of all the melodies whose character was improper, and pompous. He included the simplicity of the melodies of the eight tones in his Octoechos. He also invented for the eight tones his own musical notation. In fact this notation, which he used to write the melodies he created, traces its roots to three centuries earlier. The characters used by St John are complex and symbolic, similar to those used by ancient Egyptian hieroglyphs. Each character may correspond to a single or to multiple notes. Knowing well the theory of music, he noted that the knowledge of the melody of the tones was useful in practice, whereas the theoretical order of melody and the relation between the tones had not been studied. He first systematised the ancient octaechos and composed the theory regarding the practing of the sacred music based on the Greek pentachord or trochos. The practical application of the music theory of the ecclesiastical tones is the Octoechos. There exists St John's «Music Grammar» (or Canonion according to the definitions and the rules of the ancient Greeks). This is still preseved «in old Sticheria written onto membranes.» It discusses the division into eight tones, the creation of plagal tones fron the basic ones, the names of the eight tones, and their correspondence with ancient greek tones. Its title is also known as «Ἀρχή τῶν σημείων τῆς ψαλτικῆς τέχνης τῶν ἀνιόντων καὶ κατιόντων σωμάτων τε καὶ πνευμάτων καὶ πάσης χειρονομίας». After the enlightener Damascence, many people wrote theses on the theory of music, including Manuel Vryennios, priest John Plousiadenos, Master John Koukkouzeles, John Kladas, Manuel Chryaphes, Demetrios Kantemires, Archbishop Cyril of Tenos, Basil Stephanides the Byzantios, Metropolitan Chrysanthos of Dyrrhachion, Chourmouzios the Archiver, Theodore Phokaeus, Margarites Dovrianites, George Lesbius, Panagiotes Agathokleous, Kyriakos Philoxenes Ephesiomagnes and other among our contemporaries. The Committee of 1881, which was composed by the Ecumenical Patriarchate, also published a Theoretikon. The first poetic and musical product of St John of Damascus is the Octoechos, which was composed on the basis of his eight tone system. From the various Troparia belonging to the Octoechos, to Damascene are attributed only the Saturday Vespers and the Sunday Matins, whereabout the Anatolika Stichera belong to monk Anatolius the Studite, who lived after Damascene, the Aposticha to Paul of Ammorion or of Evergetis, the Canons to the Trinity to Metrophanes of Smyrna, the eleven Eothina to Leo the Wise, the eleven Exaposteilaria to Constantine the Porphyrogennetos, and the Anavathmi to Theodore the Studite. The Octoechos, in which the whole Christian dogmatic doctrine is encoded, was accepted in all the Churches of the East and West, by command of the Frank king Carlomagnus, while Damascene was still alive. The divine musician, besides the Canons of the Octoechos, also composed a brightest Canon of the feast of the light-bearing Resurrection «Ἀναστάσεως ἡμέρα, λαμπρυνθῶμεν λαοί». When Kosmas the Melodist, who had also composed a Canon for the same feast in tone II «Νῦν πάντα πεπλήρωται φωτός οὐρανός τε καὶ γῆ καὶ τὰ καταχθόνια», listened to St John's Canon, exclaimed: «And you brother John, you included everything in these three (words), and you left nothing outside; hence I have lost, and I acknowledge my loss; therefore let your canon have the primacy and the suppremacy, and let it be sung publically in the Churches of Christ, and let mine stay in darkness and in the corner as unworthy for the light for both its content and its mourning and lamentful tone, in which it was composed, which is totally inappropriate for the brightest and world-joyful day of the Lord's Resurrection.» St John of Damascus composed over 60 Canons for the major feasts of the Church, which are constitute a rythmic anthology of the Festive Speeches of St Gregory the Theologian and others. From the Canons of divine John, we mention: «Ἔσωσε λαόν θαυματουργῶν Δεσπότης», «Στείβει θαλάσσης κυματούμενον σάλῳ», «Θείῳ καλυφθείς ὁ βραδύγλωσσος γνόφῳ», written in iambic trimetters, following St Gregory of Nazianzen, whom he had as a model, as did Kosmas the Melodist. He also put to music the Canon of the Annunciation with alphabet accrostic «Ἀνοίξω τὸ στόμα μου», writing two Irmi for ode IV «Τὴν ἀνεξιχνίαστον θείαν βουλήν» and «Ὁ καθήμενος ἐν δόξῃ». Also the Canons «Παρθένοι νεάνιδες σὺν Μαριάμ τῇ Προφήτιδι», «Τῷ Σωτήρι Θεῷ τᾡ ἐν θαλάσσῃ λαόν», for the Meeting of the Lord, the Elevation of the Cross, the Nativity of the Mother of God, the Prophets, the Apostles, the hierarchas, the martyrs, the venerable, the renewal of the temple of the Resurrection, the remembrance of the appeared sign of the Cross to the emperor Constantine, etc. Explanations to his canons were written by Zonaras, Gerory Pardos bishop of Corinth, Efstathios of Thessalonica, Mark of Ephesos, and Nikodemos of the Holy Mount. To him are also attributed the following hymns: «Ὑπερένδοξε ἀειπάρθενε εὐλογημένη Θεοτόκε προσάγαγε», «Ἐπί σοὶ χαίρει κεχαριτωμένη πᾶσα ἡ κτίσις», «Τὴν ἄχραντον εἰκόνα σου προσκυνοῦμεν ἀγαθέ», «Ἐλέησον ἡμᾶς Κύριε ἐλέησον ἡμᾶς», «Κύριε ἐλέησον ἡμᾶς ἐπί σoὶ γὰρ πεποίθαμεν», «Τῆς εὐσπλαγχνίας τὴν πύλην ἄνοιξον ἡμῖν εὐλογημένη Θεοτόκε», «Πολλά τὰ πλήθη τῶν ἐμῶν Θεοτόκε πταισμάτων», «Τὴν πᾶσαν ἐλπίδα μου εἰς σὲ ἀνατίθημι», «Τῶν οὐρανίων στρατιῶν Ἀρχιστράτηγε», the Troparia at the Hours and the Stichera of Pascha, the 26 Idiomela for the departed and the Stichera which were composed in the monastery of St Savvas. These glorious and bright works of St John of Damascus, served as a sample for the later melodists of the Church, and were spread everywhere which as a consequence had that most of the Kontakia of St Romanos fell into disuse. To him are also attributed the following musical works: ther eight great Kegragaria, the proodics of the Akathist Hymn, the slow «Θεός Κύριος» of the Akathist, «Τὸ προσταχθέν μυστικῶς», the slow two-choir «Τῇ ὑπερμάχῳ στρατηγῷ τὰ νικητήρια», the «Ἰδού ὁ Νυμφίος ἔρχεται», the «Ὅτε oἱ ἔνδοξοι μαθηταί», the communion hymn «Γεύσασθε καὶ ἴδετε» in tone I, the cherubic hymn of the Presanctified Liturgy in tone pl. II «Νῦν αἱ δυνάμεις» and many other lessons, cerubic and communio hymns. The great lessons of St John were transcribed to the analytical music notation by Petros Peloponnesios, and by the teachers Gregory Protopsaltes and Chourmouzios Archiver.